What happens when you order a PeterGeigerArt original? Well you know what they say, a video is worth a thousand words. Give a gift that really means something. Greats gifts for great people. My client who purchased my 50 Greats from 50 States collection also requested a custom gift for one of his friends as a milestone birthday gift. The recipient is a big Indy 500 fan with many other interests that they also wanted to feature in this one piece. When I asked him how the gift was received, this is what my client wrote back. 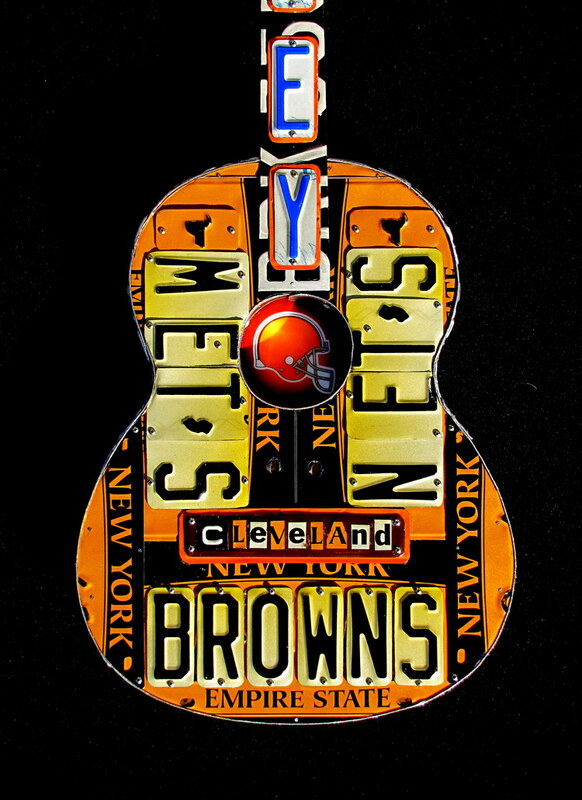 A fan of country music star Kenny Chesney asked me to create this license plate guitar. 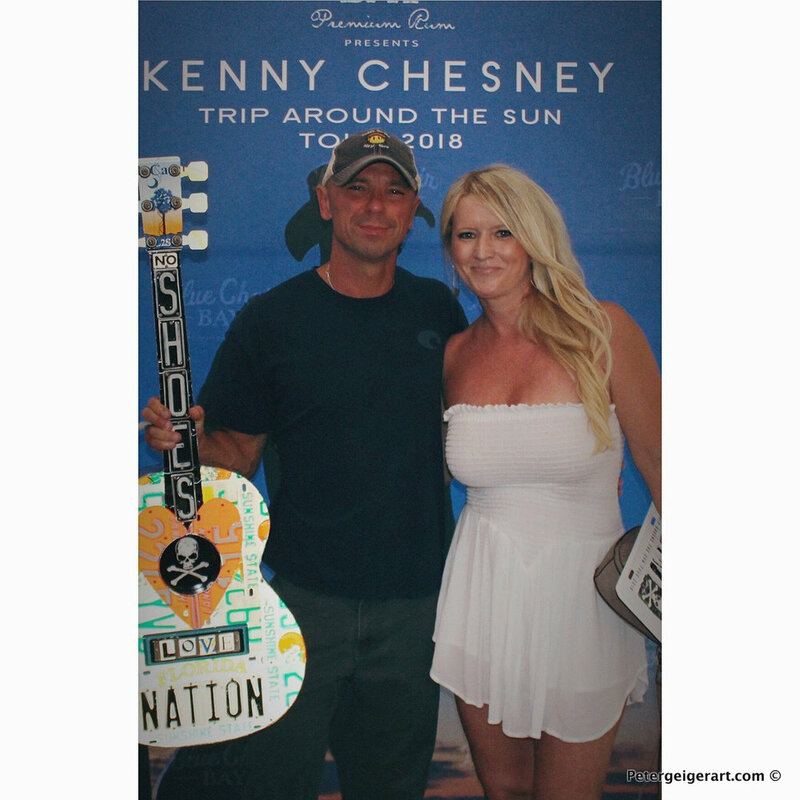 She's a big "No Shoes Nation" fan, and wanted the artwork to represent her love for Chesney's music and his fan base. She plans to give it to him at his upcoming concert in Indiana. How cool is that!? This piece was created for a client in Canada whose boyfriend is a musician. it tells a love story that's more amazing than the artwork itself. He is in a band, and loves the Toronto Maple Leafs. They both love the beach and the mountains. As her text to me indicates, she loves how this unique gift for a musician turned out. My client had been following me on social media for some time, and decided to gift herself with this special rendition of Pink Floyd and the Wall album. She requested turquoise. I think it was an excellent choice. What a way to display this wall decor. I met this client at the St. Stephen's Art Show in Miami. She purchased some there, and asked me to create some of the others. I love the way the wall decor appears in this photo. Sometimes a simple text from a client just makes my day. I wanted to share this Instagram post from my client. We had a few things to cover on his piece. I think it's safe to say that he's a happy camper. 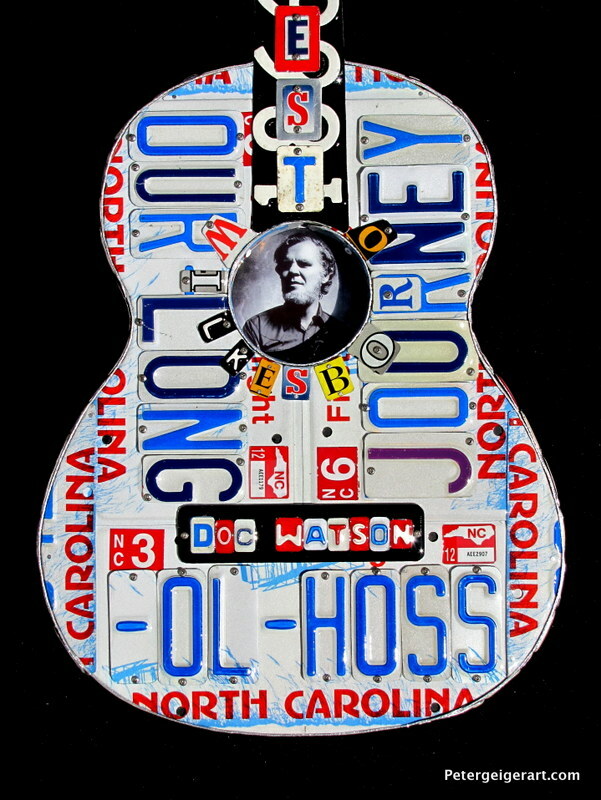 In October, I wrote on my blog about the license plate guitar art I created at the request of the National Guitar Museum. My license plate artwork is now on display. The museum's curator, HP Newquist, was kind enough to let me know. He sent me these photos of my piece in the Butler Institute of American Art in Ohio, along with these kind words. Unique gift. The one that got away. We all lead busy lives, which is why I am so appreciative when clients take the time to send me photos of the artwork I created for them. 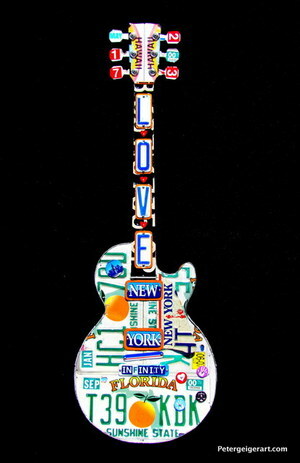 I enjoy seeing the license plate guitar sculptures I create living in their new environment. Lana Pinto recently sent me this photo of the banjo she received as a gift from her family this past Christmas. Here's what she had to say about it. My name is Lana Pinto. I met you about 5 years ago in Nashville at the fair where you were displaying your pieces. I fell in love with the banjo, tried to buy it then, but it was sold before I got back with the cash. I never stopped thinking about how much I liked that piece and that it got away from me. (haha) I have wanted it ever since. My mother Dee Ann Page, my boys and my husband surprised me with it on Christmas Day and I just love it! Thank you for being so talented and creative. Everyone that sees it falls in love with it. It is a keeper!! Special people get special gifts. They also have great stories. License plate art is a reflection of their journey in more ways than one. "Peter, it was really easy working with you, you understood what I wanted right away! all I can say is WOW!!!! The guitar is so amazing!!! Exactly what I had envisioned!!! Love love love it!!! love working with clients who need something special. This is a perfect example. I created this license plate guitar sculpture as a custom gift for an auction at the Juvenile Diabetes Research Foundation's JDRF Hope Gala 2016, which took place in April. This marks the second time they have commissioned me to create a custom auction gift for their event. I always appreciate when clients take the time to let me know how the event went. "Thank you again! The guitar was a BIG HIT! Not only did everyone who saw it before the Gala remark on it’s uniqueness and how appropriate it was to our theme, but it was the first item featured in our live auction! It sold for $2,500!! “Thank you for working with us on a custom design for our JDRF Hope Gala – Rockin’ for Research...."
Thank you for allowing me to create a custom gift for your auction. My client, Eric, commissioned me to create this series of custom corporate gifts to commemorate an important event. Each piece is detailed with the company's name, logo, date of incorporation and sale. The names of the recipients are written down the neck. Three recipients received artwork which featured the words "loyalty" and dedication" on the sides of the license plate guitar sculpture. The gifts where amazingly well received! Thank you so much for the beautiful craftsmanship and care in each guitar. Look forward to calling you again and working together on the next project. All the best, Eric Harnish"
We all lead busy lives, so it's a real honor and pleasure when a client takes the time to share a photo of their finished piece in its new home. Peter, we received the guitar and we are very pleased with how it turned out. You are a very talented artist. Keep up the good work. We really enjoy it's company. Thank you, we love it. I created this wedding gift for a husband and wife team, who both wrote to me to express their happiness with how it turned out. Wife: I described how I worked with you and relayed "our" story, so that you could create the piece. We are extremely pleased with it and am very thankful for the time you took to create such a piece of art that represents "us." Thanks again! We are so happy with what you have created for us!! Please feel free to post on your website. We would love to show others your work! Husband: My fiance worked with you to bring our story to life. It was an amazing experience for her. Last night she gave me the guitar you made for us when we got back from our wedding. I can't possibly put words to my feelings. The time you took to understand what she was trying to say is evident in every detail. Music is therapy to us, and the guitar so symbolic of what brings us together. I just wanted to say a simple thanks, although that doesnt possibly seem like its enough. I LOVE the guitar and will cherish it forever. It truly is our story that took us to our wedding day. My hope is to someday meet you to express my thanks more appropriately. And to one day be able to come back to you with "the sequel" as our lives continue to take us amazing places. Nothing would make us happier to capture those memories much the same way - though your eyes in art. Peter. Looks fantastic! You really nailed it. Thanks so much. Attached are several shots of the piece in situ (in my study). It’s really fantastic. Couldn’t be happier with the way it came out. Thanks again. Thank you, Rick, for contacting me and letting me share your comments and photos. Thank you, Lori, for giving me that honor. "We just wanted to let you know that Derek really enjoyed his guitar. We think it turned out awesome. Thank you for doing an outstanding job and caring enough to put Derek’s life history into a piece of art that he will cherish forever." "My parents commissioned a beautiful piece of guitar art from you. I absolutely love this piece! It is a really cool and beautiful way to have an artist provide a personal touch to my living space. Every time I look at it, I have happy and fond memories. I can't thank you enough for working with my parents to create this piece for me. When I read about Pete and his guitars in Our State magazine, I knew immediately that I wanted to get one for my husband. I had a general idea of what I wanted – a guitar that focused on our anniversary with aspects from both of our lives. During our first conversation, Pete asked me a lot of questions about my husband and two themes emerged – music and cars. We developed a concept and made the decision that it would be an acoustic guitar with a focus on my husband’s interests and would also include some of my history. Pete had some great ideas and he left me with some additional questions to ponder. I then got to work finding our license plates. Fortunately, we had some that Pete could use and I also ordered a couple online that had the logos of the universities we attended. After I got my thoughts together and Pete received the license plates, we had two additional brainstorming sessions where we continued to narrow down the choices of what to include on the guitar and where. It was very collaborative and I enjoyed being part of the creative process. The guitar incorporates our anniversary date, my husband’s favorite bands and cars, our colleges, our hometowns, and other reminders of our lives. I was very happy with both the design of the guitar and the craftsmanship. It is very well done and my husband and I will enjoy it for years to come. "He Listens to You, and You See it in the Final Product"
My wife and I happened upon Peter’s artwork at the “Artsplosure 2012 – Raleigh, NC Arts Festival” during a business trip to the area. I was awestruck by the beauty of the guitars he had on display and was amazed at the detail and craftsmanship that was contained in each piece. I talked to Peter for about 10 minutes about his process, how he made them, and how he really enjoyed creating each piece not only for his customer, but WITH them. We took one of his business cards with us when we left his booth, and all weekend long we kept talking about the guitars we saw. I knew that I was going to order a guitar but did not know exactly what I wanted the design to be. When we got home from our trip, we made the decision to relocate to the NC area for work. Having lived our entire lives in New England, it made perfect sense to ask Peter to create a guitar that represents our roots. I spent the next year scouring flea markets, on-line license plate sites, asking friends, family, and co-workers for plates, and even random strangers if they had any old or extra license plates that I could have or buy to make the guitar. I carried Peter’s card with me all the time and showed people what it was that I was going to do with the plates. By the time we moved to NC, I had almost 2 dozen plates that represented all six New England states, all our major sports teams, and logos and pictures that had meaning to us. When we met with Peter, I told him only that I had a “few plates” that I would like to use in the creation of the guitar. The look on his face when he saw what I brought him was priceless, and I could almost see the wheels turning in his head designing it as he listened to us describe what each plate meant to us. We spent the next hour down in his workshop laying out the plates in different combinations, placements, and together we all came up with basic idea of what the front of the guitar would look like. Some of the pieces came together immediately (Sports teams), but Peter had the vision to put together other tags to tell our story in a way that we hadn’t thought of. We were engaged down on the beaches of Cape Cod, and he took the Lighthouse and Whale tags and used those to depict that part of our life, along with the lighthouse in the center. The positioning of the sports teams made perfect sense, and we agreed that would be the foundation of the guitar. When we left Peter’s workshop that night, I knew that we had agreed on a design that would be wonderful, but he had carte blanche to finish the design as he saw fit. He said he would use the Maine Lobster at the top of the neck, but would think about how to complete the rest of the piece. I knew in my heart that he would create something beautiful, but I had no idea that Peter would create a piece of art that so accurately represents our families. Along the outside of the guitar there is a picture of a cardinal which is for my mother; it is her favorite bird. Next to that is the profile of New Hampshire’s “Old Man Of The Mountains”. This is for my Uncle Karl who lives there and was and is the father figure in my life. On the other side of the guitar is the zip code of where we lived before moving to NC, a picture of Mr. Potato Head who is made in RI, and a Newport Yachting boat for my wife’s parents who grew up in RI. The final piece of it all was the spelling of “New England” down the neck of the guitar. Adding our anniversary and initials for the keys topped it all off. When I went to pick up the guitar, Peter brought me in to the room where he displays his latest pieces. I saw it hanging on the wall under the spotlight and was speechless. I couldn’t speak for a couple of minutes and will proudly admit to having a tear or two in my eyes as I kept circling around it, looking at it from every angle. My wife couldn’t be there that night when I picked it up, but when she got home and saw it, she had the same reaction as I did. It was beautiful to watch her eyes dance over the guitar as she noticed each detail, picking out things that I had overlooked at first. Peter “got” us. He listened, he cared, and he understood what we were hoping to capture in the guitar, and he made our story come to life. There is nothing else that you could ask of him when creating this. You hear his passion for his artwork when you talk to him, you see it as he walks through the design process and how he listens to you, and you see it in the final product. We just moved in to our new home in NC and I am proud to say that this guitar is the first item that we hung on our walls. It is proudly displayed near the entrance of the house and is the first thing anyone who enters sees. I am now working on collecting plates to have another guitar made next year and cannot wait to go through this experience with Peter again. "He was very overwhelmed! He says that he continually looks at it and finds more and more things that he missed that evening because of all the excitement. We had about 240 people there, and they all had to come up and look at it. I heard MANY compliments and everyone thought the gift was completely fitting for him." "American Folk Art from One of the New Great American Folk Artists"
"When I first saw Peter's guitars at Greenville, SC's Artisphere, I knew I had to have one. The hard part was to pick just one. After speaking with Peter, he agreed to do a custom piece. That made it easy. I wanted a Springsteen guitar. Peter not only took all my input but then did what he does best, which is create a piece of art. The final product is amazing, and everything I could have hoped for. I feel like I now own a great piece a American folk art from one of the new great American folk artists. Created especially for a Springsteen fan. The signature plate holds special meaning for the recipient of this gift, and makes this surprise 60th birthday gift even more meaningful. Gary's dad was Kansas highway patrolman who was killed in the line of duty only weeks before his scheduled retirement. Gary received this plate in his honor. When his wife asked if she could "do something" with it, he handed it over reluctantly, but soon forgot about it. Last weekend was his 60th birthday party. He wrote, "I was grilling dinner when I noticed everyone congregating. They serenaded me with Happy Birthday, then my wife walked up with something in her hands. I could see it was guitar shaped, but as I looked it over I saw that my daughters' names and birth dates were on it, that the word LOVE was spelled out on the neck, that our wedding anniversary was on the head piece, but the most amazing part was the K47 plate across the body of the guitar! It was the best possible gift I have ever received or will ever receive." "Early this morning I was eating breakfast in our kitchen and something caught my eye in the living room. We had hung the guitar there last night. The light from the kitchen hit the reflective materials in the plates and the whole guitar was glowing as if it were alive. Most amazing way to start my day! I look forward to gazing upon it for the rest of my life. Thank you again for all the efforts that you expended in the creation of the work of art. It will be treasured in our family for generations!" Thank you to your family, Gary, for giving me the opportunity to make it. "It's gorgeous! I love it! You did an awesome job, and it will be a focal point in our family room with the new design so that everyone who comes to the house will see it -- a perfect conversation piece and a beautiful tribute to our family! Your talent and passion are evident. You have taken pieces of our family story and fused them together to create a work of art that will be treasured!" "I can’t thank you enough for the amazing gift! My husband ordered it for my birthday. Your attention to detail is incredible. You managed to include everything he asked for. From the types of plates used representing places we have lived, the personalized touch with the names and dates, to the picture in the middle. Your creativity and ingenuity are impeccable!! I would highly recommend this as a gift for anyone!! This one of a kind unique piece of art will hang on my wall and remind me of my husbands love every day for the rest of my life. The fast delivery of this wonderful gift was perfect. With my husband’s work schedule, he was home when it was delivered and he was able to share in my joy when I opened it. Thank you again!!!" - Tina H.
Learn more about this piece and see details. "I wanted to tell you how much I am enjoying my custom made guitar!! I have shared it with several friends and they are amazed at the details of the design and construction. The design process I experienced with your creative resolve and talents truly resulted in a "one of a kind" custom guitar that tells a wonderful story and sheds light into my own personal life. It was so exciting to see my idea come to fruition! A truly wonderful experience that I will never forget! Simply priceless. Keep up the great work and I hope to work on another project with you in the future." - Mike R.
"I received the art and it looks amazing! You included everything that I wanted and it just looks awesome. Thank you so much for doing this for me. My husband will love it. I would certainly highly recommend you to anyone searching for unique piece for themselves or a loved one." - Cheri T.
Learn more details about this piece. Read more details about this piece.